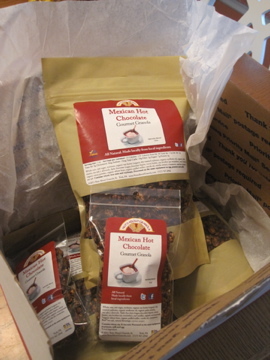 Mexican Hot Chocolate Granola Giveaway! 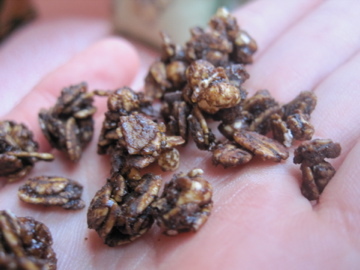 If you guys guessed Mexican Hot Chocolate Granola in my last post, you were right! I received a package with a big “Nuts About Granola” sticker on it yesterday, and despite my sugar hangover I couldn’t tear open the box quick enough! To bring any new readers up to date, a few months ago I entered Nuts About Granola’s “Next Best Thing” contest. They asked people to suggest a new granola flavor based on a type of cuisine. My Mexican Hot Chocolate flavor was chosen as one of three finalists, and then thanks to tons of votes from fantastic readers and friends it WON! 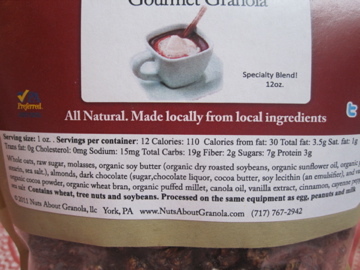 Nuts About Granola is a company started by a mother/daughter team, Gayle and Sarah, and is based in York, PA. They believe in using only natural, organic ingredients in their products. There are no artificial chemicals, dyes or preservatives and everything is sourced locally. Sarah began selling their granola as a fundraiser for her college’s Triathlon team, and eventually in 2008 Nuts About Granola, LLC was born. The “Plain Jane” peanut butter granola was the original favorite, but now they feature the “College Staple” that tastes like a PB&J, the “Lovers Combo” that mixes peanut butter and chocolate, and a few specialty flavors like “Orange Creamsicle”. You can even get Gluten Free granola! The product is sold mostly in small PA farmers markets and online, but they are hoping to expand so long as they can maintain their healthy, local, and small-batch business model. They’ve been chosen for the Emmy Awards gift bag and were a Rachael Ray Show snack of the day! I decided to try my creation straight up – just dumped it into the palm of my hand and ate away. I was curious as to how the company would balance the sweet and savory flavor combination of Mexican Hot Chocolate and was happy to see they included both cinnamon and cayenne pepper on the ingredient list. You can also see that there are little dark chocolate chips sprinkled throughout the clusters. I LOVED IT. It is unlike any granola I’ve ever tried! The dark chocolate is rich and not too sweet just like it should be, and there is a definite spicy kick at the end. It doesn’t taste like it will put you into a sugar coma (which was much appreciated since I was pretty much already in one at the time) and would be perfect atop of some plain or lightly sweetened yogurt. Seriously this is a totally new arena for granola with the sweet and spicy side by side. I’m so excited about it!! 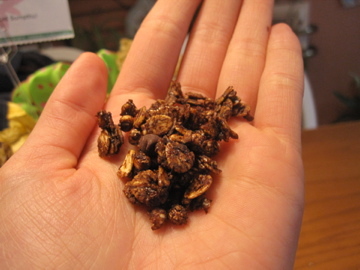 SO, want to try some Mexican Hot Chocolate Granola for yourself? TWO lucky winners will receive a bag of granola. You don’t have to have a blog to win, but I’m going to have to limit this to U.S. readers only due to shipping costs. There are three ways to enter and please leave a separate comment for each entry. I’ll pick the winner by random number generator on Wednesday May 18th. Plain Jane sounds delish! Although I would probably eat a bag wayyyy too fast. Lover’s Combo looks great! Peanut butter and Chocolate. YUM! The Mexican hot chocolate flavor intrigues me the most. It’s seriously one of my favorite drinks. I just tweeted about the giveaway, but I hope I win! This sounds so delicious! I love that you won the contest. Anything with chocolate and granola is good in my book. I also think their Off the Road version sounds great – I love dried fruit! The Lovers Combo sounds fantastic! I think the plain Jane for me! Went on the website. The PB&J looks the most delish since I’m obsessed with peanut butter and love the twang of cranberries. If I don’t win I’ll have to order some of yours. My family is obsessed with spicy chocolate. We’re always ordering spicy chocolate covered pecans from a local Texas company. I’d love to try Purely Simple! I am a little biased because Sarah is a good friend of mine so I think her granola is just fantastic. I’m dying to try her Chocolate Mint flavor (I think it was a seasonal promo). Every one I have tried has been amazing so far. I can only imagine the Mexican Hot Chocolate is just as wonderful as you describe. Can’t WAIT to try it! Well, duh, the flavor I want to try is Mexican Hot Chocolate! The other one that looks really interesting is carrot cake. And it sounds totally amazingly delicious! I would love to try the Mexican Hot Chocolate or the Smores, both sound too good! I think I would go with the mexican hot chocolate or the plain jane!! I want to try the mexican chocolate it sounds yummy! I think your Mexican Hot Chocolate flavor sounds amazing! I grew up drinking that stuff! lol 🙂 The Plain Jane sounds tasty too! Oh my gosh Smores sounds amazing!! omg the college staple and lover’s combo looks AMAZING!!!! 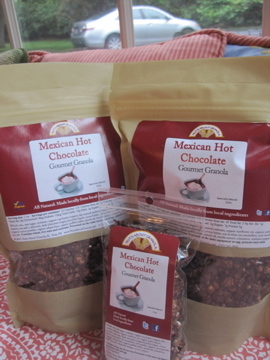 I want to try the Mexican Hot Chocolate granola… it sounds awesome!! I think the orange creamsicle flavor would be delicious!! i couldnt pick just one i’d like to try— date food, smores, and mexican hot chocolate all sound awesome! and i’m sure college staple is great too! Congrats on your win and that creative flavor!! I like the ‘Off the Road’ flavor and I’d be interested in trying both the Purely Simply and your Mexican Hot Chocolate!! There are so many to choose from! I would love just the plain jane gluten free. . . but that jungle fever looks great too!! yyuuummm! I want to try it! TWEETED! I tweeted! that mexican hot chocolate sounds awesome! s’mores and mexican hot chocolate! College staple sounds divine. reminds me of snacking on granola and pb while writing my thesis. Orange Creamsickle sounds so great!! s’mores sounds so good! yum! Mmmmm I bet it is good! Good job on the win! Actually, the Mexican Hot Chocolate has me the most intrigued! I’d love to try purely simple…low fat and sugar…sounds perfect! If i could only choose one, it would be the college staple. But I’m thinking I’ll order the variety pack anyway since i’m so indecisive!! YOURS sounds amazing – congrats!! Although I cannot handle spiciness, so carrot cake sounds amazing and I will for sure be checking this site until fall. The Lover’s Combo sounds wonderful!! I’d love to try your flavor: Mexican Hot Chocolate! I love the combo of chocolate & cayenne – so good! I’d try Mexican Hot Chocolate or Lover’s Combo.. can’t decide! Lover’s Combo or Mexican Hot Chocolate for me as well! Well, mexican hot chocolate of course. 🙂 The college staple one sounds yummy too. Your creation or Lover’s Combo sound delicious! Great idea on the flavor and congrats on winning the contest! They all sound delicious! It is a toss up between Plain Jane and Mexican Hot Chocolate! Yum! Lover’s Combo or Mexican Hot Choco! ooh pb&j or yours both sound great! such great flavors! @fittingitallin is having a Mexican Hot Chocolate granola giveaway! I tweeted but it wouldn’t let me include the link because it was over 140 characters. Carrot Cake sounds like all kinds of awesome! Wow! Thanks for all the compliments. We have plenty of granola on hand if you want to try some! I would like to offer a special deal to all of [Fitting it all in] Readers: If you buy ANY 12oz. bag, I will throw in a 2oz. bag of Mexican Hot Chocolate for FREE. All you have to do is type [Fitting it all in] into the “buyer comments” field when checking out and one will be included with your order. Thanks again!!! This offer will be good until the 20th just in case you are holding off on being one of the winners. I think the Lovers Combo sounds wonderful! I would love to try Plain Jane! Congratulations on winning the contest! I am really excited for you, and the fact that Nuts About Granola is based around where I live!